Chats are routed according to a few simple rules. They can be automatically routed to agents or they can go to a queue from which they are picked up. 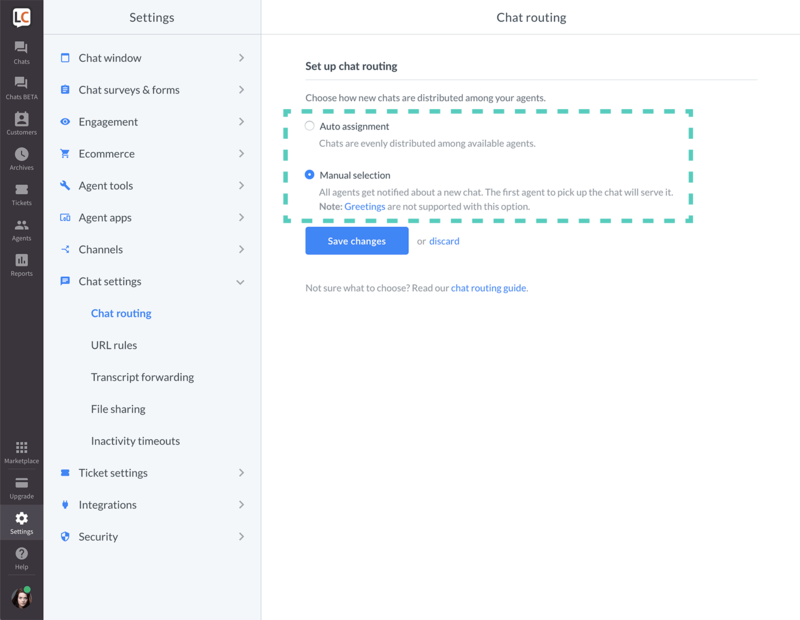 You can set routing in chat routing settings. Each new chat goes to the first available agent with the Accept chats status on. When all agents have one chat each, the next round will be distributed. It will go on until the concurrent chat limit of all the agents accepting chats at the time is reached. You can set a limit to the number of chats your agents can have at a time by editing agent profile. Chats from returning customers are an exception to this rule. They go to the agent that has previously chatted with the customer if this agent is accepting chats. 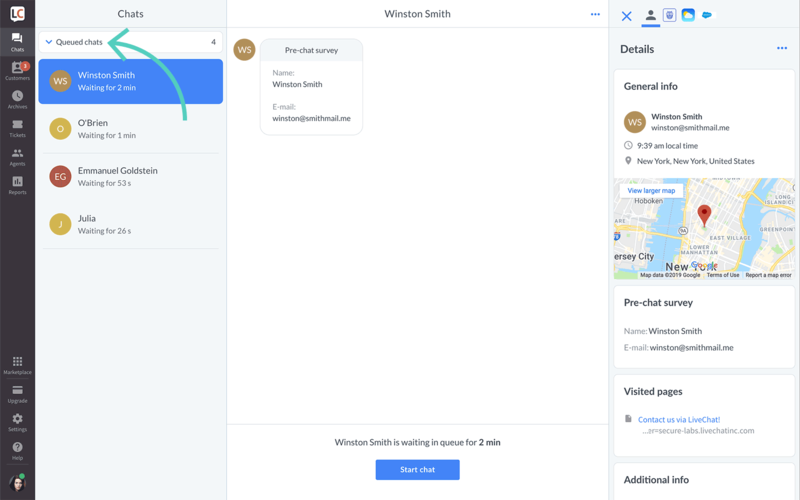 A chat will be automatically transferred to another available agent if the first assignee doesn’t respond for some time. This time period can be adjusted in inactivity timeouts section in Team and Business plans. For Starter this timeout is set to 3 minutes and cannot be customized. When an agent loses connection or closes the application chats will also be distributed to the available agents. Chats can be transferred to all agents, even those with the Not accepting chats status. You can use this to pass chats to experts in a particular field who only handle a particular set of cases. With manual chat routing, the customers who started chat will be directed to the queue. All agents with the Accept chats status will receive a notification about that event, and can pick up the customer from the queue and start a chat. They can do that by selecting a customer from the queued chats list and clicking on Start chat button or by using a keyboard shortcut. As soon as one of the agents picks up a chat, others won’t be able to do so. Chats are also distributed according to groups. Automatic chat routing distributes chats from a specific group to agents from that group. With the manual chat selection enabled, only agents from a particular group will receive a notification when a new chat for that group is available. You can still transfer chats between various groups. Log in to LiveChat and go to Settings → Chat settings → Chat routing. Choose Auto assignment (for automatic chat routing) or Manual selection (for manual chat routing). Click on Save changes to finalize.